Composer of the famous waltz Moonlight on the AlsterOscar Fetrás’s influence during his lifetime went far beyond this one work. Born in Hamburg he became the most talented light music composer that Northern Germany ever produced and right from the start modelled his own composing on that of his idol, Johann Strauss Jr. At the age of 26 his compositions attracted the attention of a Hamburg publisher and he adopted the name Fetrás, his real surname being Otto Faster. He was of German descent and his musical talent came from his father, who was from the locality, and his mother was from the island of Sylt. He soon rose to the position of conductor of the Uhlenhorster Färhaus which was the most famous restaurant with ballrooms in Hamburg for which he composed his second most famous, but now forgotten work, Uhlenhorster Kinder. In 1943 the building was destroyed by Allied bombing and with it the original score of Moonlight on the Alster. It is interesting to note that it might have been Franz von Blon who was at that time the conductor of the Stadttheater Orchestra who introduced Moonlight on the Alster at the inaugural concert for the ball season in 1888. It was a sensation anyway and earned Fetrás the title of 'The Hamburg Waltz King'. Soon he was invited to tour Germany, Austria and France with his orchestra. He became personally acquainted with Johann Strauss. 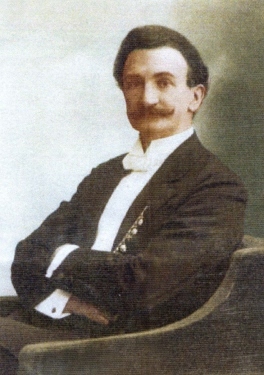 In 1904 he won a prize for his composition Frühlingsluft and later he wrote the excellent potpourri Reiche Mädchen (a reworking of Johann Strauss’s 1897 operetta Der Göttin der Vernunft. The complete Die Göttin der Vernunft operetta has been released (2011) by Naxos, whilst the Reiche Mädchen Potpourri has been recorded in cooperation with our Society by Marco Polo on their two CD production of Johann Strauss operetta potpourris. Fetrás remained well known and respected and though definitely a second rank composer in the Viennese style, he produced some 300 works. All text and pictures © The Johann Strauss Society of Great Britain, 1997-2019, unless otherwise acknowledged or indicated. Trademarks and other copyrights acknowledged as belonging to their owners.